Typical - you wait two and a half years for a Second Doctor DVD and then three discs turn up at once! The reason for the gap is because there aren’t that many Troughton episodes left to bring out on DVD. After this, barring any surprise discoveries of missing episodes, there’s only the incomplete The Ice Warriors and the rather feeble The Dominators and The Krotons. 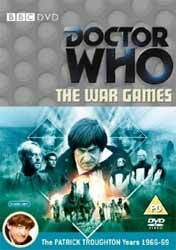 The reason for the hefty three-disc nature of this release is because it’s the ten-part whopper that is The War Games, the final regular adventure of the Second Doctor (Patrick Troughton), Jamie (Frazer Hines) and Zoe (Wendy Padbury), the final Doctor Who serial of the 1960s, and the last one to be recorded in black-and-white. As with several previous stories from this season (the show’s sixth), the duration of The War Games was the result of efforts to keep production costs down and to replace scripts that had fallen by the wayside. Script editor Terrance Dicks and his co-writer Malcolm Hulke had very little time to get the first scripts ready before the serial went into production. Given the circumstances under which it was made, it’s amazing The War Games turned out as well as it did. Just as Terry Nation and Dennis Spooner did a few years earlier with the 12-part epic The Daleks’ Master Plan, Dicks and Hulke keep things interesting by transporting the main characters to a variety of locations - in this case “time zones”, in each of which a different war is being waged. These conflicts include the First World War, the American Civil War and the Roman campaigns. The first two episodes take place almost entirely within the 1917 zone, so that at first the story seems to be a well-realised historical, and then, when the commanding officers start to act strangely, a pseudo-historical, like The Time Meddler. Only after the cliffhanging final scene of Episode Two do we get any views of other war zones. In a way, the black-and-white era of Doctor Who ends as it began. Like An Unearthly Child, Episode Ten of The War Games almost stands alone as an episode in its own right, connected rather tenuously with the serial to which it is nominally attached. Whereas An Unearthly Child introduced us to the Doctor’s travels through time and space, and introduced the Doctor to two of his travelling companions (Ian and Barbara), Episode Ten sees the Time Lords bringing the Doctor’s journey to an end, separating him from Jamie and Zoe (a poignant farewell), and exiling him to Earth with a new face (though we don’t actually see the transformation, as Jon Pertwee had not been cast at that point). Like The Daleks’ Master Plan before it, the quality of The War Games is elevated by the involvement of a superb director, in this case David Maloney, who would go on to direct classics such as Genesis of the Daleks, The Deadly Assassin (both of which contain some similar themes and imagery) and The Talons of Weng-Chiang. It’s true that the production has its shortcomings, such as Zoe’s rather cursory but miraculously successful search of the General’s office in Episode One and a fuse that doesn’t burn down quickly enough in Episode Three, but overall the production values remain impressive given the nature of their assembly (as producer Derrick Sherwin points out in the audio commentary, cutting the tape back then really did mean cutting the tape... and then sticking it back together). The Restoration Team have smoothed over at least one rough edge of the original production, prolonging a background sound effect that ran out too early during Episode Five, as well as carrying out their usual sterling work cleaning up ancient footage to the highest possible standard. However, perhaps they have restored certain shots too well, for in close-ups of Captain von Weich (the splendid David Garfield) we can see the gauze of his fake scar extending over his eye. Throughout the serial, Patrick Troughton provides his usual mixture of over-the-top tomfoolery and more intense character moments (such as his riveting confrontation with the War Chief). Meanwhile Frazer Hines gets to return to his action man role of earlier stories, while Wendy Padbury shows that there’s more to Zoe than sparkly cat-suits. The regulars are ably supported by a mammoth guest cast, the most notable among the allies being David Savile as Lieutenant Carstairs, Jane Sherwin as Lady Jennifer, Michael Napier-Brown as Arturo Villar, and the aforementioned Graham Weston, with Noel Coleman as General Smythe and the aforementioned Edward Brayshaw, Philip Madoc and David Garfield among the villains. The first two discs contain five episodes apiece. Each instalment is accompanied by on-screen production notes and an audio commentary featuring Terrance Dicks, Derrick Sherwin, Frazer Hines, Wendy Padbury, Jane Sherwin, Graham Weston and Philip Madoc (not all of them at the same time, mind you). The third disc boasts a veritable SIDRAT full of special features, including the fascinating “making of” documentary War Zone (36 minutes, 25 seconds); Shades of Grey (21 minutes, 45 seconds), an insight into black-and-white television production; and an interview with make-up artist Sylvia James (8 minutes, 30 seconds). There’s the customary Now and Then feature (9 minutes, 30 seconds), looking at the locations used in The War Games; while the ongoing Stripped for Action (13 minutes, 45 seconds) turns its attention to the Second Doctor’s comic-strip adventures. This DVD also kicks off a couple of documentary series: The Doctor’s Composer (17 minutes, 30 seconds) examines the early work of musician Dudley Simpson; while On Target (20 minutes) looks at the Target range of Doctor Who novelisations, beginning with those penned by the highly respected Malcolm Hulke. I expected Time Zones (15 minutes, 20 seconds) to be worthy but dull, dealing as it does with the real-life historical periods that inspired this serial, but in fact it makes for interesting viewing and doesn’t outstay its welcome. My favourite special feature is Talking About Regeneration (24 minutes, 25 seconds), an in-depth yet witty analysis of the ever-changing depictions and implications of Time Lord transformation in Doctor Who. The most intriguing feature is ten minutes of footage from Devious, a fan-made video production set between The War Games and Spearhead from Space, which features Jon Pertwee in his final (but chronologically earliest) appearance as the Third Doctor. Ten episodes of truly essential Who, The War Games was well worth the wait. Advance and capture it now!